As soon as AV equipment is unboxed and installed, whether in a boardroom equipment closet or a dedicated machine room, it is at risk from the adverse effects of power and heat anomalies, natural phenomena such as lightning and earthquakes, and theft. Juice Goose’s CQR-1500 is a 15 amp power sequencer which features AC power filtration and surge protection. The SurgeX SU-1000Li includes common mode and normal mode Impedance Tolerant EMI/RFI filtering, and provides a web browser-based interface to manage power settings, customize diagnostics, monitor multiple computers, and schedule shutdowns and restarts. Panamax/Furman’s BlueBOLT technology provides secure, hosted IP system control over compatible Panamax and Furman products. The system is implemented through a plug-in interface card that provides an ethernet port, according to John Benz, marketing manager, Furman Sound. “The whole system is cloud-based and accessed through a local area network. That gives us flexibility in the future, because it’s software based.” The software may be configured to send mail or text alerts. As Peter Cook, vice president, Juice Goose noted, in addition to offering protection against surges and spikes the company also focuses on high frequency interference on the AC line, which creates audio or video static and can come from fluorescent or neon lights, dimmers and motors. “That can occur between line and neutral [normal mode] and neutral and ground [common mode],” he elaborated. Surges are less of a threat to current AV equipment, Schluter believes. Modern switch mode power supplies, unlike older transformer-based designs, can cope with voltages in the range of 100V to 240V. “If a voltage surge comes along and swells it to 150V, anything that’s fed with a switch mode power supply is going to deal with it,” he said. Tripp Lite’s LCR2400 Automatic Voltage Regulation system is rated at 20 amps/2400 watts and offers EMI/RFI filtration along with surge and spike protection with a total of 14 outlets. Where a fan is required, Schluter recommends a thermostat-controlled device. “We want to shut off the fan whenever it’s not needed, for the dust and for the energy. In today’s world, where we all should be caring about the planet, we want to turn things off when they’re not needed.” An air filter can help guard against dust buildup. Although AV equipment may be installed in certain instances alongside IT equipment that must remain operational in the event of an earthquake or, perhaps, terrorist attack, it typically poses only one specific threat, noted Schluter: “Far and away what we see everywhere is protecting people from racks falling over, the physical damage of a rack on somebody, and preserving egress.” At locations outside earthquake zones, such protection is largely limited to equipment in buildings rated as first tier response centers. Schluter is also seeing a move toward three-point latches on rack doors. A rod that locks the top and bottom edges of the door in addition to the key latch prevents anyone from gaining access by bending the door. 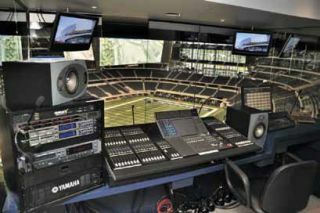 SurgeX equipment protects the Dallas Cowboys Stadium LED display, which is the largest in the world at 11,200 square feet. Shannon Townley, CFO and SVP of sales for SurgeX, listed several critical installations that include the manufacturer’s gear, including the Dallas Cowboys Stadium jumbo screen, the capitol buildings in Arkansas and Texas, and the Hynes Convention Center in Boston, MA, which recently installed 35 SurgeX iControls. APC’s S20BLK network manageable AV power conditioner and battery backup has a built-in web server, RS-232 port, and an environmental monitor, all designed to enhance remote management and help prevent unnecessary service calls. Of course, where products like the S20 truly save money is in protecting equipment. Donovan shared a story about a commercial and residential AV installer in Georgia who had a client with a 6,000-square-foot summer home with two APC S20 power conditioning battery backup units protecting home file servers, AV gear, and a GE security system. Noting that there are simple calculators and other resources available on the web to determine how many cubic feet of air per minute a fan must move to maintain a set temperature, Schluter offered several examples (nameplate wattage converted to amps). current draw was 2.91A, a resultant 1,164 BTU, needing only 72 CFM. Cisco TelePresence Suites are protected by Tripp Lite. Tripp Lite’s power and network control solutions have been selected by Cisco Systems to protect the company’s flagship technology, Cisco TelePresence Suites. Tripp Lite’s integrated solution for Cisco TelePresence includes UPS Systems, Power Distribution Units (PDUs), KVM Switches, power management accessories, and more. Because TelePresence technology is highly dependent on safe, reliable power, Cisco needed a sophisticated power protection solution. Rick Santina, technical marketing engineer for Cisco’s TelePresence Exchange Business Unit, chose Tripp Lite to provide that solution. “Right from the beginning, Tripp Lite has provided protection you can count on,” Santina said. He noted that since the Tripp Lite solution was implemented, Cisco TelePresence has never experienced downtime that impacted a customer meeting. Steve Harvey (psnpost@nbmedia. com) has been west coast editor for Pro Sound News since 2000 and also contributes to TV Technology and Pro Audio Review. He has 30 years of hands-on experience with a wide range of audio production technologies.